The thing here is that, by focusing on the two packages on which virtually all of KDE is built, the rest of KDE gets uninstalled too, as they depend on the above. Then I did aptitude autoclean, and reinstalled with aptitude kde5 (I think). Anyway, it all works perfectly. Better than reinstalling, which I've done before for this. Interface with Internet by directly uploading into a buffer, so things were not lost when the earthquake hit. Sufficient sensitivity to calibrate with distant earthquakes, by comparison with others. I got as far as putting two adxl345's with a Raspberry Pi 2. It would get cheap with a raspi zero. But the adxl345 isn't very sensitive. I got a factor of two increase by doubling and summing them. Then the new Mcube accelerometers caught my eye, they should have been 16 times more sensitive. But, alas, the raspi can't work with them because they need i2c repeated starts. And that seems to be deficiency of the main computer chip in the raspi. I even consulted 'the smartest guy in the world' (who wrote wiringpi), and it seems hopeless. I've made every search possible and I am totally defeated. But I did get to learn g++ along the way, and for me, many hours wasted on this, isn't really wasted. I was having another nightmare, and this was imaged from my brain. Ha, I made that up! Anyway, here's a tiny clip of my daughter leading her Zumba class. I just got one for the house. All it is ever used for is Facebook, YouTube, and email. A Chromebox (cb) can do that and so much more. I like the small size and no noisy fan. The kids usually turn off their computers in their bedrooms because of the noisy fan at night. This is easy to set up, and no worries about viruses and other gunk. I'm happy because I'm the 'goto' guy when things go wrong. And boy, can they go wrong in the win world. A Chrome extension allows access to my Samba network, and Cloudprint allows printing on the local printer which is connected through Chrome. From what I was reading, ChromeOS has gone through all its teething troubles, and is solid. The only thing I read is that you may want 4 gb instead of 2 if you have a lot of active tabs open. I never do. I tried all the utilities such as docs, sheets, etc, and they all work. G+ allows simple photo editing, etc. On my main machines, I do video editing, scanning, etc. It will be a while before any of this can go through the cloud. But if you have anybody you 'support', like neighbours, or relatives, get them a Chromebox. This is only good if you have a good hdmi monitor, and the keyboard, etc. I wouldn't get them a Chromebook if they are not used to to laptops. My old guy recently got a win 'all in one' all on his own. The computer is attached to to monitor, and will be impossible to 'convert'. I don't recommend standard Linux, like I have, because you have too many problems with updates. Problem1: itunes, the most horrible thing in the world. The library can be moved to the laptop. No there isn't such a standard, but I love to start one. Except I don't get paid, and I really, really hate endless meetings. Perhaps somebody else could do it. Businesses, such as shopping malls, are getting into liability problems if they do not evacuate for seismic ground motion as small as 1 mm/s. The evacuation process has it's own hazards, as well as a loss of business, if it is not required. 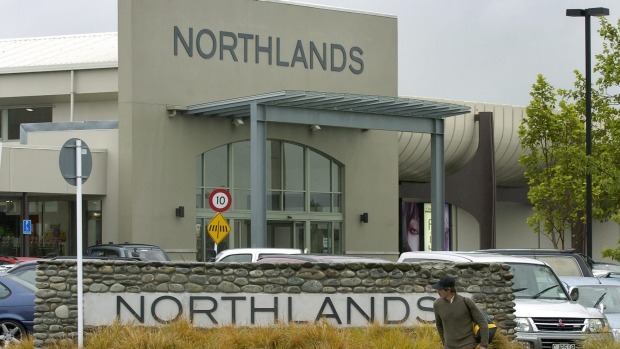 For large shopping concerns, there is the problem of carts left, and items stolen. City centres have their own problem with unnecessary evacuations. There is simply not enough room for everybody, unlike a fire evacuation which only involves one building at a time. As we have seen with the constant rain of Toronto building glass, there is a problem with early evacuation during an actual earthquake of 20 cm/s. Many people will be killed on the streets, who would have been perfectly safe, had they stayed indoors. We propose a new CSA standard, which will require simple instrumentation of all structures, tied into an PA system. Using latest seismic engineering, the committee will devise PGV levels, of at least 3 levels -- No evacuation, delayed evacuation, and orderly evacuation. This is expected to save many lives, and releases businesses, and public places, the burden of deciding these things for themselves, resulting in a chaotic mishmash of different standards, as well as endless lawsuits. They want some more info, but are still constrained by the original narrow scope. I'm not saying anything, Justin, but if you want something interesting, then 'think out of the box'. 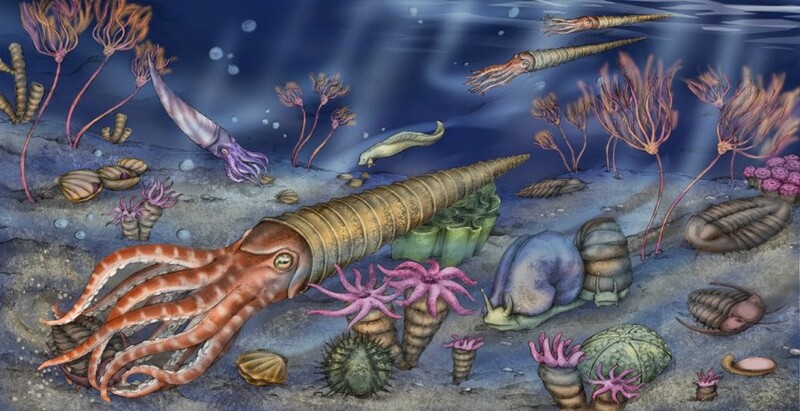 What about the Precambrian geology? Oklahoma ignores it at their peril. We Canadians are supposed to be better than that. What are the constraints on pumping and grout? Where are you going to put all that water? Inject it? Grout causes more air pollution (being made) than vw diesels. I am trying to build a cheap and sensitive accelerometer using the Raspberry Pi2, moveable over to the Zero, if it ever comes available. You need extreme sensitivity if you want to calibrate these things with distant earthquakes. You also need a lot if you want to have a picture of the earthquake. I don't think 'early warning' will ever work if you put some weight on false alarms, which nobody seems to be doing right now. Accelerometers used to be monstrous things, with big weights and coils. I fooled with them enough, and they were horrible. Then they came up with MEMS or micro-machined accelerometers. This involved a complicated arrangement of putting down layers on silicon and etching away little bridges with acid. People provided 'custom etchings' for a high price, but these had a large mass and were very good with low noise. Then they came out with 'chip' versions which are in every phone. The one I'm working with now is the 5 year old adxl345, with only 10 bit sensitivity at 2g. I'm trying to sum two of them for greater sensitivity. The physics is against these small things because the proof mass is so small and subject to thermal noise. I can see the noise in the lower bits. I don't think this will work that well. I have ordered a 3610 breakout. It is 2x2mm, surface mount, so you need something that can go on a breadboard. The super-new 3575 is the same process (I think) at 1x1mm. But I am wondering about the physics. Computer chips get faster as they get smaller, I'm hoping that there is some physics that no longer requires a heavy proof mass to deal with thermal noise. Perhaps a suspended quantum dot? This is exciting, and I really hope that other people do it as well, since I am soooo slow. ps. I just summed 2 adxl345's (the maximum together) and it is really good. Gives me another bit of sensitivity. I can't wait to see what 4 bits will do. I got 2 raspis for Christmas by accident. I'm using one to make my super-cheap accelerometer for earthquakes, and I decided to use the other for monitoring my APC UPS, I got from Costco. These things are tricky. First, you must reach to the back of the pile to get a fresh one. Lead-acid batteries must be refreshed in storage, and they don't do that for these. Then you must check that the voltage is over 12V before you plug it in. This can be done with apcupsd on your main Linux computer. I got a bad one that had been left too long the first time. For some reason apcupsd works perfectly on my main Debian machine, but the raspi has proven to be a pain. You really need this in the modern age. 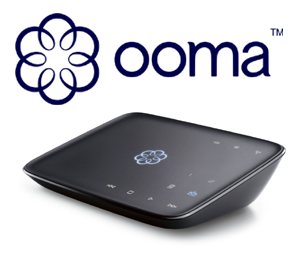 I have my modem, router, and ooma phone on it. It will last 3 hours with this, which is enough time to communicate that you are fine after an earthquake. If I put a big computer on it, it hardly lasts at all, so the raspi is perfect. Don't forget that the old phone line always worked in a power outage, but with an earthquake, it always overloads. The key to making it work is to follow this link, for multiple UPS's even though you only have one. The automatic feature does not work for the raspi. Once you get it working, you can configure it to send out emails, etc. I'm just using it for logging. A fine taste of old man Winter this weekend. Up in Haliburton, it was close to 40 below. 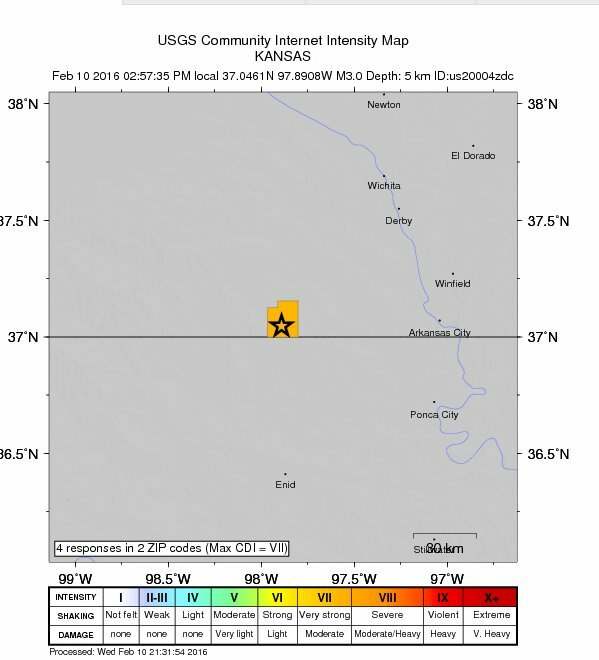 And while I was there, with just my tiny phone, they had a 5.1 in OK. 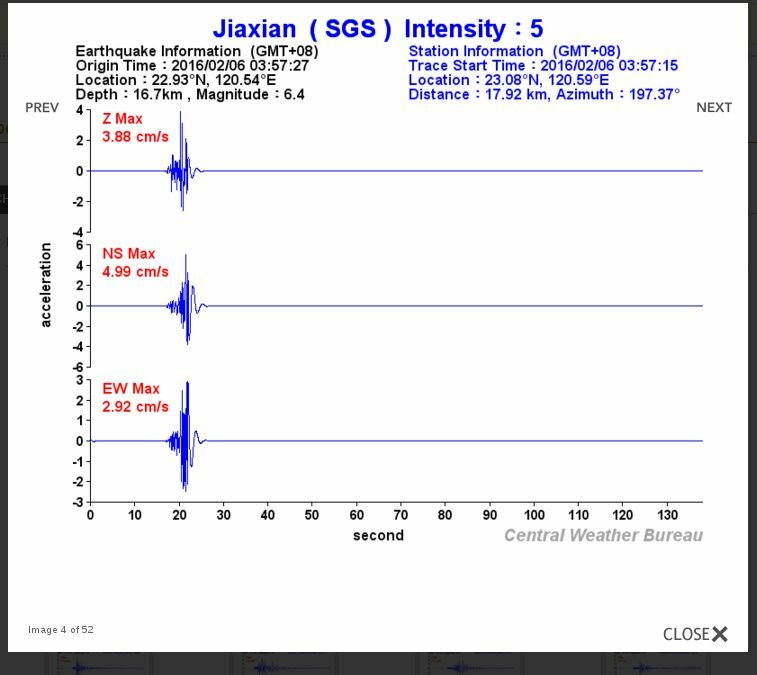 The largest determined magnitude was a 6, and I'll go with that because of the extreme directivity for these earthquakes. This was directed downward, so not much PGV at the surface. Would that all earthquakes were like this. But no, we can now expect a 5-ish strike-slip aimed at Wichita. These are not what I call 'closers'. That will happen towards the end of the year. We're talking 5plus thrusts, that rumble the city, or the oil tanks. That will shut down US oil and gas, and the other guys will jack oil back up to 100 bucks. 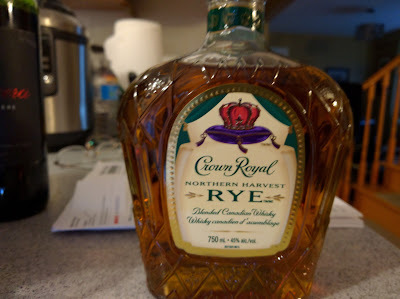 We Canadians will make out like bandits. Here's the video of the approach to the relative's cottage. It was only -28 C at that time. I'm in haliburton no computer. Sad. Oklahoma earthquakes - Anthony Courthouse finally falls down. Maybe, maybe not. 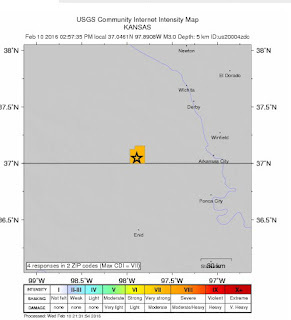 But they are reporting a whopping intensity 7, for a pukey M3 earthquake. What could it be? All these houses are in crumbles, a tiny earthquake could be the last straw. This must be a very shallow thrust, but these can pack a punch like an explosion. So neat, one tiny block. Can't wait for the local news crews. ps. 3 responses showing intensity 7 at Bluff City which consists of one empty school and 3 buildings. Yeah, cold weather hits Toronto. I'm going up North this weekend. Can we hit 30 or 40 below? Keeps the fire ants away. The ocean currents are resuming their normal pattern, but there is still a residual of displaced hot water that may continue to bring rains to California (but most likely not). The cloud map shows the residual. I have completed my ooma-ization. I have my old number back with no more calls from India. It got so bad that we never answered our phone. Now we can answer it, for calls from our friends and family. Bell didn't screw up my Internet, I now have a 'dry loop', no extra effort needed. Make sure you have decent Internet. Do a DSLreports speed test. Make sure you don't have too much bufferbloat. I have 30 ms download, but up to 400 upload and everything works. If you have the old black modem from Bell, do everything you can to get the white one. Get a fast tp-link router that runs openwrt, or any super fast router. Receive the unit, and set it up. Plug in any old phone in the phone jack. Don't buy their handset. My cheap vtech wireless set does everything. Phone lots of people. When you are convinced that it is perfect, start the port of your landline number. Don't do anything with Bell. When you get the email that the number is being ported in a few days, don't answer your phone. That will the Bell killer ladies offering you a half price on services that you will get with Ooma. It is rude to laugh at them. When everything is ported, celebrate with cheap wine, which you can now afford. For extra savings, turn your cell phone into a cell tab, and use Ooma app. But you have to give up standard texting, and use google hangouts. You can still call out 911 on the regular cell phone if there is an earthquake. pps. Yesterday a telemarketer got through, from a big bank. I was so happy to put them on the community blacklist. Yeah! As well, although I could learn a lot, North American engineers will be oblivious, since they are stuck to California. A map of PGV (peak ground velocity) around the epicentre. This will tell us the angle of the thrust fault and which side has the hanging wall. A PGV map of the whole region will show us the soil amplification. Right now I think it is a factor of 10 in PGV, but we need a close pair of soil and rock sites. PGV and Intensity, or structural damage. I'd love to know if we had standing waves. Seriously though, Taiwan is the best in this whole thing. I shudder to think about other countries. I finally found the strong ground motion, here. I just knew they put it out right away. This is the beautiful clean plot near the epicentre on rock. I am assuming this by the low value and short duration. Max PGV of 5 cm/s . It would be a lot of trouble to make sure this is hanging wall or footwall. This was my guess by the damage. In Taiwan they have stated there should not be any structural damage until 50 cm/s and this is good target. You can see that the solid buildings did well. Tin can buildings fell, as well as soft storey buildings. Inspection is everything! In Chile, this made soft-storey condos lean over, and this has happened here as well. For your homework kiddies, find the location of these sites, and see if there is a big difference between hanging and foot wall. Also find the siting reports for these instruments. Note: 40 in Chile for the main city. 80 right up next to the quake, and that made a solid building tip over in one piece. 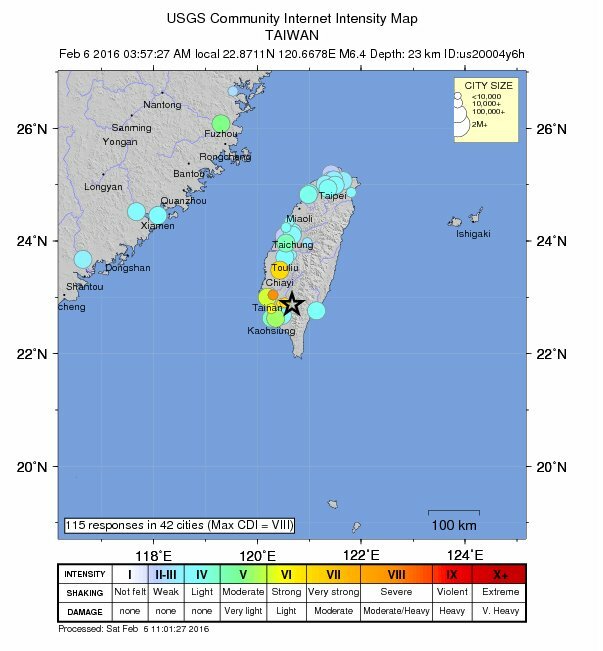 M6.4, very small in this region, but location makes the difference. 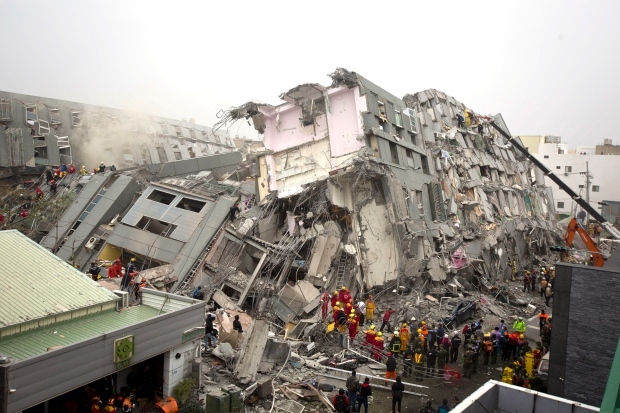 In general, nobody builds better than Taiwan, but this has spaghetti rebar, and weak concrete. We'll have to see what the strong motion was, especially the PGV. They know how to record strong motion, unlike anybody else. 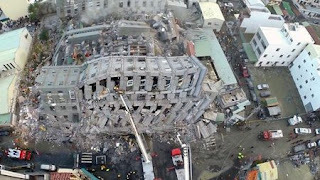 For this type of damage, we need a PGV over 1 m/s and this building is on soft soil. 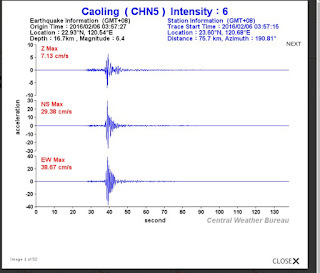 We will learn a lot from this earthquake, mainly how useless 'early warning' is. Most of all, this is not a 'plate margin' earthquake. 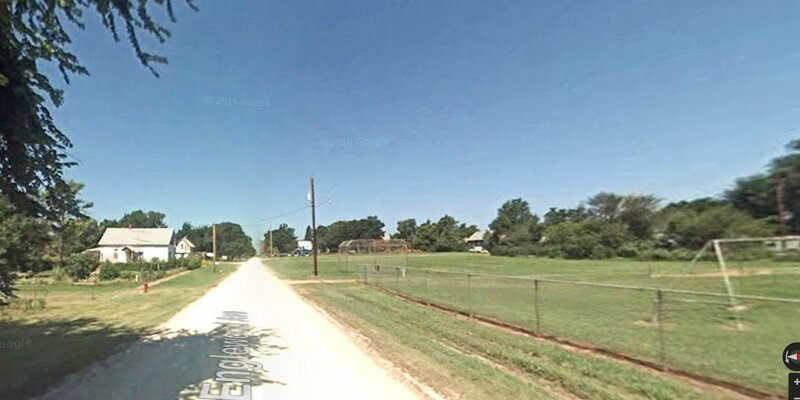 This is an Oklahoma and Toronto earthquake. It all depends on where the 'hammer' of the thrust is. Looking at the data, these towns were right in the hammer zone. ps. In any picture of an earthquake disaster, look at the buildings with no damage. 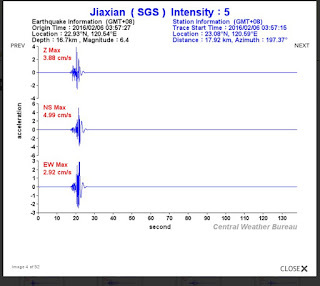 Wow, thank goodness no major aftershocks, which we would not expect from a clean thrust. pps. Turns that building was a criminal effort with tin cans used as filler. I wonder if the PGV even hit 50, probably 20-30 cm/s. I'm amazed such criminality could work in Taiwan. pppps: Less than 10 seconds early warning while people were asleep. Let's call that a fail, shall we? ** oh man, am I being evil. I'll being doing a series of these on YouTube. I can jump around and yt fixes it like I have a steady cam. My brain refuses to accept this as reality. You are viewing images from a crazy brain. Be warned, do not view this if you are having anger issues, take a pill first. ps. I won't be doing any more of these until they destroy a lot more land. They are going to put a bridge to the other side, and then excavate a road to lay down the new riprap. I'll wait until something happens. This is from an Oklahoma school. The whole school is crumbling from a succession of small earthquakes, probably at a PGV of 1 cm/s. OK also has serious foundation problems from years of drought. They have the notorious shrinking/swelling clay, and they just construct with slab on grade. Nevertheless, every school I've ever seen has these block walls. Why don't they construct them like a new Walmart, with a steel frame? The Pickering nuclear station is lousy with them. We called them 'handyman' walls, unengineered because nobody thought it was important. They have a seismic capacity of 5 cm/s if they are undamaged. I write these things 'live', with only a general thought as where I am going. But it's time to sum up. We are back to my original graphic. 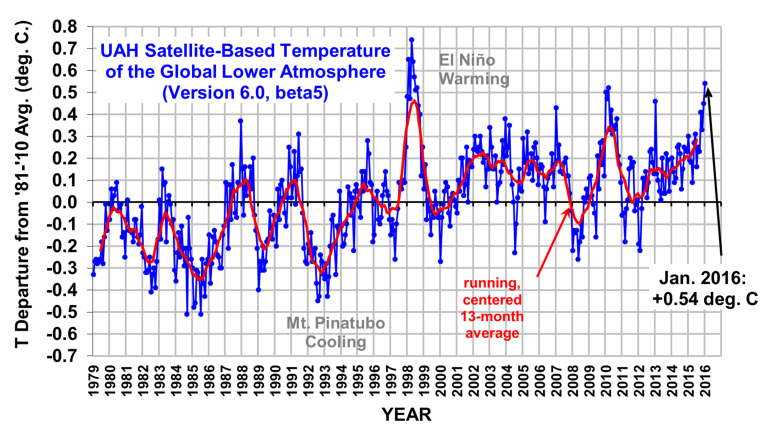 This is Dr. Roy Spencer's graph of background microwave measured by satellites. It's really the old space man's attempt at warming his hands, or a measure of how much heat the Earth is putting out. Dr. Spencer thinks it is a direct measure of the Earth's temperature, but it isn't really, because of the extreme insulation of those wet clouds. The neat thing about clouds are that they are a 'one-way' insulator, like a heat pump. The sun warms the top of the clouds, and that heat is carried by the rain drops down to the earth. But the big volcanoes put out ash which has a two-way effect. It stops heat from coming and going out by killing clear air convection. CO2 does neither, and clear air convection kills any effect it might theoretically have. 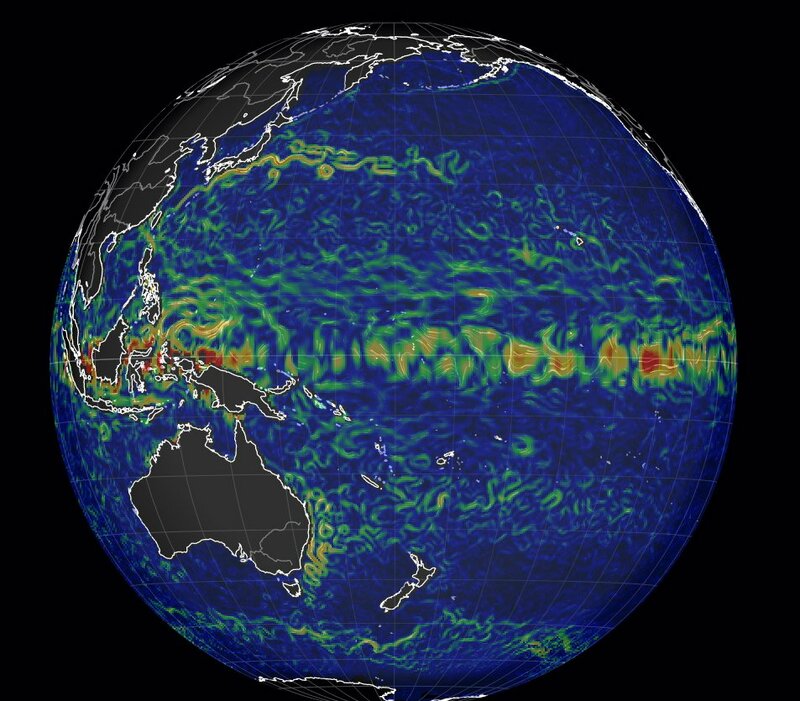 El Nino disrupts the fairly static cloud distribution over the equator. It warms the poles and causes a huge amount of heat to be radiated out to space. We pay for it with a cold 'hangover'. 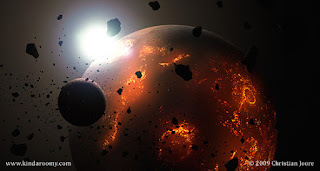 Now for the reason of 'hot and cold Earth' over millions of years. It's ocean currents which we know, from our water-cooler cpu coolers are a most efficient heat pump. With large expanses of ocean during the 'crunch' phase, we just get equatorial currents, with very little North-South. Of course, there is the matter that the grouped continents are a giant insulator, and they start to bake the deep subducted oceanic slabs. This produces a huge amount of water vapour, and, yes, CO2. No ocean currents, and tons of water vapour make for a hot time. During 'Snowball Earth', of which we are now entering, we get efficient heat pumping from ocean currents going to the poles. These currents are directed by the continents themselves, since ocean currents would be happy just staying at the equator. There was a great day in the Earth's history, one which is never mentioned. That was 'Cross-Over Day' when solar heating became the greater heat problem for the earth to dump. Maybe it happened a few billion years ago. Maybe it hasn't happened yet, we don't have a great handle on this. It's a question of solar infra-red conversion vs. geothermal flux. Somebody should know. 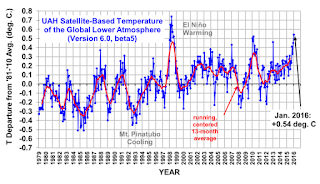 Nevertheless, the earth has to shed a great deal of heat, and it has done so for a billion years, never getting too far out of shirtsleeve temperatures. We no longer have a perfect radiator, it is bunged up by continents and, most of all, water vapour. This is a gif of 'heavy air', saturated with water and constantly raining. The big swirls are what causes our weather outside this zone. 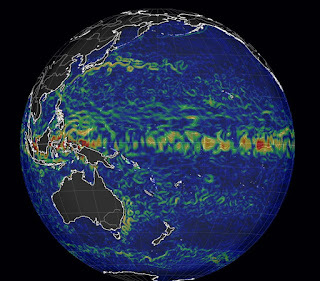 Right now the big wad in the middle is El Nino, and California is getting lashed with storm plumes. Good for them. I'll tell you now that no matter how hot it is, that old space guy is not warming his hands over those clouds. They are the perfect heat pump, moving the heat back to earth. So, his only hope is warm ocean where there aren't those clouds. This only happens with big ocean currents, and high-speed air. The better this process, the more efficient the Earth Radiator. Clear air over continents sheds all solar heat in an hour or two. Ask anybody who's camped in a tent. So, we can imagine the Early Earth, more than 4 billion years ago. Actually, these are all stupid pictures because we had a giant gas cloud like Venus, filled with all sorts of crap, mostly methane. Everything was a roiling boil, which was a good thing for 5 Billion Year Old Man, since in outer space he could warm his hands evenly all around the planet. No hot and cool spots, no stupid greenhouse gases. That's the wonderful thing about convection, it overwhelms everything, and is not a greenhouse. It's sad, but this perfect handwarmer was radiating out so much heat that it started to cool down. The Sun was a dim bulb then anyway, I don't even think they had lit it yet. :) 100% of the heat was geothermal, mostly the residual of planetoid collisions, but I think our nuclear furnace started soon after. All this cooling led to a nasty scum forming on the earth, the continents that we live on. Later it got cool enough for oceans, but you could still fry an egg on your head. Like a steel blast furnace, the slag was formed of silicates, pure iron went down to make our compasses work, and heavier stuff went to the core, whatever that is. If you are 'pro-life' you'd be happy about all this, although life did horrible things at first. 'Life-Made Climate Change'. Those early bacteria should have made a lifestyle change and all become hippies. But for the Old Man, the slag was terrible. It made hot and cold spots for hand warming. Thick pieces insulated the heat, causing more to be radiated out in thin spots. The thin spots were oceans, so the water was boiling for a while, not nice to critters. But eventually, thanks to efficient heat radiation, life became possible, and photosynthesis contaminated everything with oxygen - The Great Poisoning. These are the happy plates at maximum bunching. From a physics point of view, what does this do the Earth? Can we think it was nothing? Nobody has really looked at this, so the world 'consensus' is that nothing much was going on. But I digress. We must realize that our Earth is a giant heat radiator. If you were in outer space, you'd feel the warm glow, like a fire, and could warm your hands. :) Not really. I've done this before, but I'll do it again. This is about the physics of the earth, or geophysics, which our warmists never want to think about. Not that I'm saying they are wrong, but they like to push out all the variables and uncertainties. I'll never 'deny' what they believe in. The last big 'hot time' was our famous dinosaur Mesozoic. There were plenty of mammals just before in the Permian, but then they left and let dinos take over. 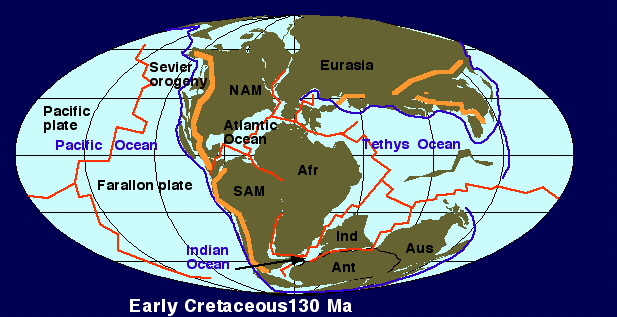 Also, plenty of big volcanoes and meteor impacts during that time. They did nothing. Now we have entered our modern era of plastic litter, but more importantly, we are going into another 'Snowball Earth'. There were plenty of these before. Surely we can't expect a giant CO2 tap turning on and off for these episodes. And there were no steam engines in those days. I'm sorry, but carbon is out as the fundamental cause. The fossils show that water was still water through those cycles. The cause of the big cycles is the motion of the plates. Somehow when they are all squashed together, we get really warm, and when they are evenly apart, the whole Earth freezes. Find that in any geology book, I dare you! :) So the Billion Year Old man has two outfits, bathing suit and winter coat. 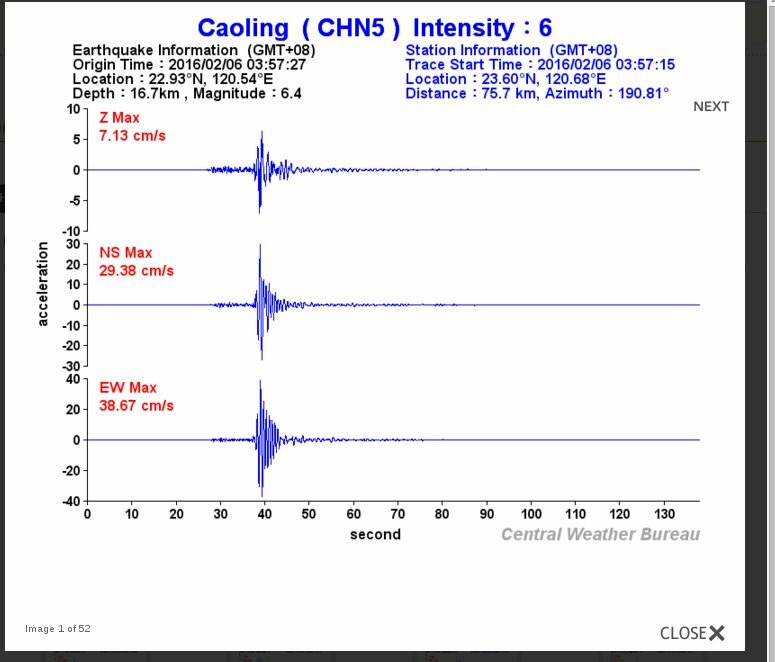 There's nobody else in the world looking at this (Stupid Seismic Early Warning is much more fun), but I like to dig into the physics for this. Since I have no money, it's all in the form of Einstein thought experiments, which are really cheap! This is a wonderful tale of geotechnical engineering in the marsh lands of Toronto, by the Humber River, site of slope failures and fish ladders. This is life done right. I applaud the geotechnical engineer. Everywhere they are going with heavy equipment they have cloth and a foot or more of high-grade Granular A. There will be no disturbance of the ground, and the stuff is easy to peel off at the end, with the fill being uncontaminated, and ready for re-use. Great! This is run by the City and is for a sewer relining project. The other story, 500 m down the river, is not so happy. Instead of the City, this is the local Toronto Conservation thingy group. No pictures and vague names listed here, because what they are doing is almost criminal. This is the site of my famous slope failures, where the river is cutting into the slope, on top of which are silly people with leaky swimming pools, causing the slope to fail. These people have screamed enough that they are re-doing the protection wall. You can imagine a shear block wall trying to hold this slope against the river. The wall always looks perfect, but it is getting undermined, and the slope goes with it. 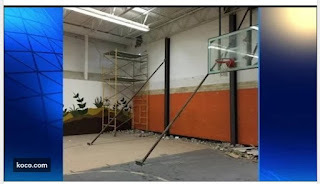 Some person got the low-ball contract to rebuild the wall. I shudder to think what they are doing, since the wall is perfect, it's the channel at the base which is the problem. I just would have just slung some armour stone in that channel. Good enough technically, but maybe not the best 'political optics'. The site is nearly impossible to get to, and there is a big river in the way, which is in flood right now with our weird winter. No nice base for them. They are plowing through with heavy equipment, creating Flanders soup*, 2 to 3 feet deep. They want to plant trees after, but the land cannot recover from this, because the silt gets sorted and packed. Sort of like farm scrub land, but ten times worse. I'm just watching the whole thing. 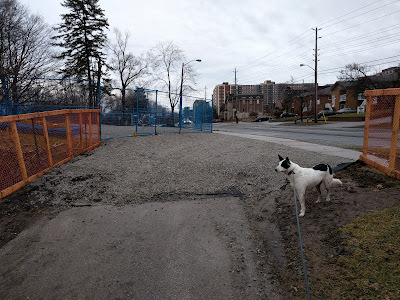 The rain and warm weather are all ready to conspire to cause a big slope failure, when they remove the old wall. I can see houses and swimming pools coming down. Big lawsuits coming. But I never said anything, nor saw anything. Stupidity is the best defence! I'm sure everybody higher up is getting ready. VW should write a manual! *'In Flanders Fields the poppies grow...' Because the land was so chewed up in WWI that nothing else can grow! ps. I want to push the fact that I never saw 'The World's Worst Geotechnical Project', the project is a work of fiction. If some 'power' read this, and pulled the job from my imaginary yo-yo's then that maffie company would send someone to break my legs, or even worse, sue me! :) That's why this is a strictly satirical blog. OMG! This is the cheapest ac router in the world. Naturally, I didn't want to use it as a router, but just an access point. The firmware it comes with is in all Chinese, and I wanted to put in openwrt. This is not a project for you! It was not a project for me! In the end I got it working with the latest openwrt image. It has a lot of power and full ac. But I don't how I got it working. It was 2 days of almost full time effort. All the company firmware is in Chinese, so there are videos on how to get through to change the ip number. Once you get it on the main system, then you can use Google Translate. Then it's endless sites for hints on how to put in openwrt. Amazing! Anyway, all these old posts listed problems with the radio and the power. I can say that this has now been solved. I feel like doing it all over again, just so I write down clear instructions .... naah! ps. I think I'll buy another one. It would make a great bridge for an old laptop to this access point. :) That will force me to start all over again.